Most people in the world will think of home insulation only in terms of energy savings. However those that live in very cold and extreme climates have other concerns too. Heat leaking onto your roof can damage the house. 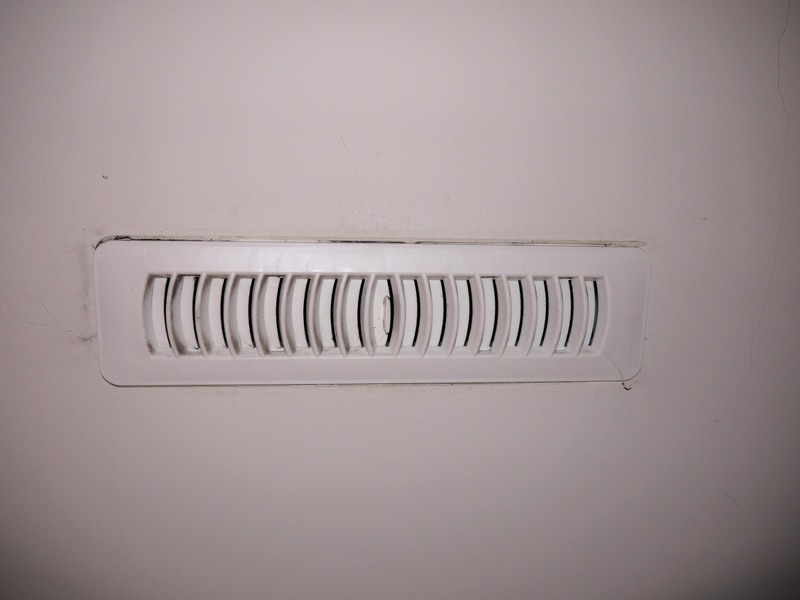 Older homes might have other air flow patterns such as vents on the sides of the house. Soffits and air vents on top of the roof (ridge vents) are however the most effective way of venting the attic. Almost all new homes in cold climates are built like that. The main point of this type of ventilation is to keep the roof cool in winter. It has as well the added effect that the building material can breath. Should ever any drop of water or condensation or humid air get in then it can evaporate again and escape through the vents. Glas fiber wool is excellent for this application because it can breath too and does not trap water. By keeping the roof surface cold we are trying to prevent the snow on top of the roof from melting. The snow remains often a powder and wind will blow some of it off after a couple of days. This prevents excessive snow accumulation on the roof and "ice damming" at the same time. Note that this kind of attic ventilation works well in cold and mainly dry climates. It can not be used in hot areas with a lot of humidity for long periods of time. Of course in reality there could be all kinds of reasons why the attic ventilation and insulation does not work as expected. Many factors play a role and I get to those in the troubleshooting section. 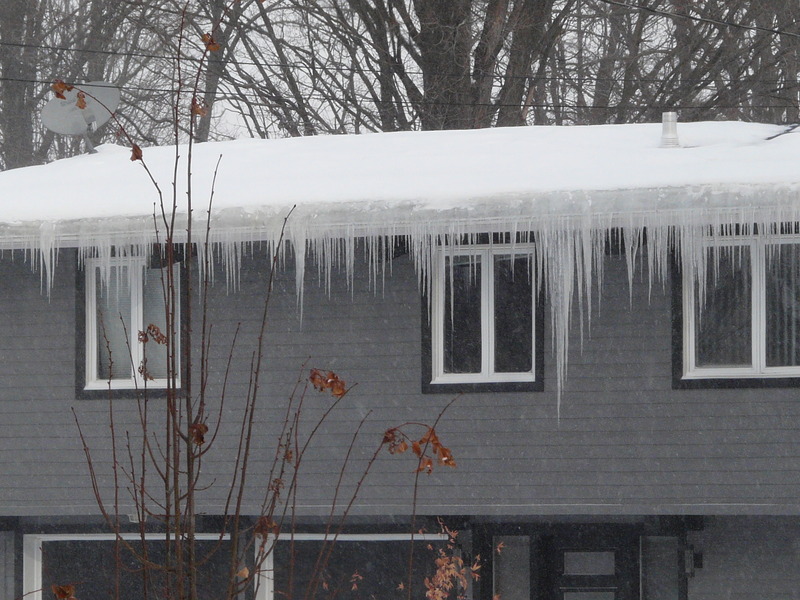 Let's first understand what ice dams are and why you should care. If the attic is warm enough to melt some of the snow on top of the roof then the warm water will run down below the snow towards the eaves. The eaves are always cold and the water will freeze again. A block of ice forms. The block of ice is normally below the snow and difficult to see but in most cases houses with ice dams will as well have icicles and they are easy to see. Ice dams on the eaves (the snow on top of the roof is not shown). When the weather gets later in the season much warmer then all the snow will melt. A big puddle can form behind the ice dam. Roofs with a slope and shingles work only if the water can run down the roof. Standing water on such a roof will back-up behind the shingles and run into the attic and from there it can run into the house, stain the walls and cause other damage. The amount of damage depends on the amount of water that enters the home. How cold should the attic be? This is the main reason why I wrote this article. I could not find any information as to how cold and attic should be for it to work properly. If you try to find informaiton on this subject you will find many posts from people that think that the attic will have the same temperature as outside once it's ventilated. That is obviously wrong. Anybody with an unheated garage attached to the house will know that it is most of the time above freezing in that garage even when the garage window is slightly open to allow for ventilation. There will always be some heat leak from the house into the attic and it is important to have the attic a bit warmer otherwise condensation and mold would form. My home had problems with ice dams for many years and it took me a while to fix them. I had sensors installed in the attic to monitor what was going on. This allowed me to collect data, something that nobody seems to have done before. 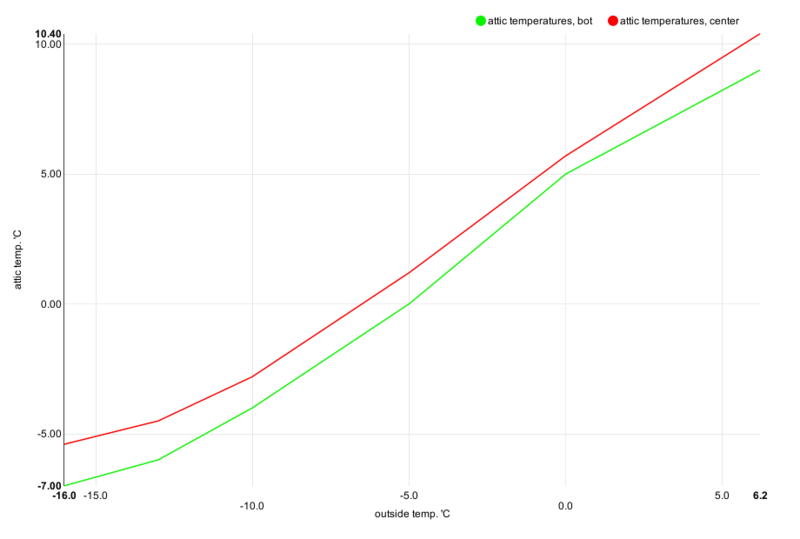 Attic temperatures as a function of the outside temperature. Red: temperature at the top near the ridge of the roof. Green: about half way between ridge and eaves. All temperaturs in 'C. The above graph shows temperatures at a point where I had the insulation just good enough to prevent ice dams. This is the limit. In general you want to have a slightly colder attic but this would be just good enough. The curve is approximately linear down to -10'C. Theoretically it should be totally linear. I am not sure what the non-linear effect is. You can use the following formula to calculate the max. attic temperature (Ta) given a known outside temperature (Toutside). Ta = 5 + 11/13 * Toutside The formula is valid for outside temperatures from around 0'C down to -10'C. All temperatures in 'C. An attic temperature lower than Ta is better. However your attic should alwasy be at least a degree warmer than the outside to avoid mold and condensation in wet weather conditions. The above measurements were done using a roof with a slope of 1/3 (roofers call this for some reason a 4/12 slope). Ice dams are obviously less of a concern the more slop you have since a higher slope will reduce the size of the water puddles that can form behind an ice dam. The temperature measurements where always taken on days with no wind. Strong winds can influence the temperature in vented attics significantly. Climate/Weather conditions: Temperatures are throughout the winter below -5'C with the exception of very few days. Those periods with daytime temperatures above -4'C are no longer than 3 days. Most ice dams are not visible because they are forming below a cover of snow. It's however possible to see the actual ice in very special weather conditions where not a lot of snow had fallen and most of the snow did already melt. The big block of ice will melt last and you can see it. An ice dam, visible after a few warm days. The dam melts last. 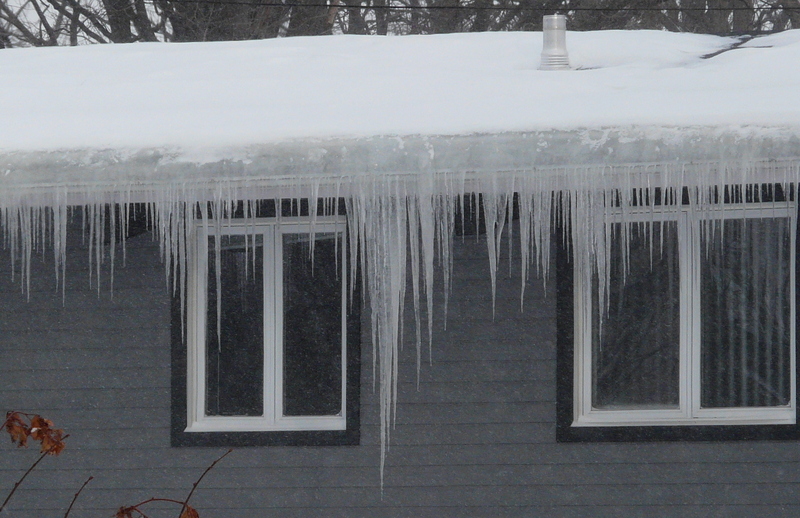 Icicles hanging from your gutters are normally the only way to know that you have an ice dam. The icicles fall off first when the snow starts to melt and the ice dam disappears last. Most contractors will tell you that you just need to add more insulation and improve the ventilation of the attic. It sounds simple but the problem might have other causes. It is alwasy nice to get "expert advice" but in the end there is nobody that knows your house better than you. You are observing it throughout the year and in different weather conditions. Nobody will be a better expert than you, the home owner. You can find the cause of the problem if you keep your eyes open and observe carefully. Here are is a list of things to investigate. Are your soffits acutally functioning and can the air get intro the attic? Is the insulation inside the attic too high and therefore blocking the air near the eaves? -> You can buy styro-foam rafter vents that can guide the air along the bottom of the roof. Was spray-in insulation (loose glas fiber or cellulose/paper) used in the attic? If yes then take an inspection camera and look from inside onto the soffits. 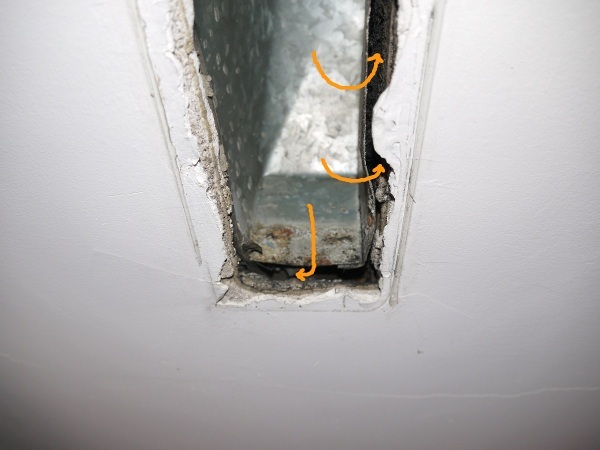 Your contractor might have been spraying all over the place and did accidently put a nice layer of insulation on the inside of the soffits which reduces the efficency of those soffits. In older houses where soffits had been retro-fitted: Are the soffits really open or is there a board behind them with just a few small openings in the board? How can the air get out of the attic? You should have "Maximum"-vents on top of the roof for optimal ventilation. Older houses might be ventilated on the sides. Those side vents can not be combined with vents on the top of the roof since this would just short circuit the air flow. Ventilation is however only in very few situations the cause of the problem. You don't need much ventilation if you have proper insulation. More insulation is not always better. With glass fiber insulation you need in Canada a layer of about 30cm to 40cm. If you have already about 30cm and you get icicles then adding more insulation is not going after the root cause of the problem. Can air from the rooms below the attic leak into the attic? Are electrical boxes where lights are installed in the rooms below properly covered? Pot lights are especially a concern and they might guide a lot of warm air from the living space into the attic. Those electrical boxes and pot lights can be covered with an air tight box or wraped with aluminum foil. Is the access to the attic (hatch) air tight and insulated? Is the vapor barrier damaged? This is a polyethylene foil below the insulation. It's a common problem that contractors doing renovation work damage that foil but forget to repair it. A special permanently sticking tape must be used to repair the foil. Can air from the heating system leak into the attic? 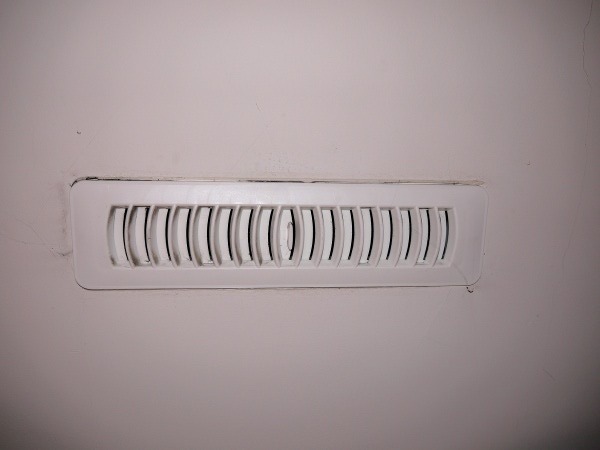 Do you have heating ducts leaking air into the attic? Are the air vents properly installed in the ceiling or can they blow air into the attic ? (see further down for an example from my house). Go on a cold day with an infrared thermometer into the attic and check the surface temperature of the insulation around the heating ducts to find leaks. Even better if you can get an infrared camera but they are very expensive. 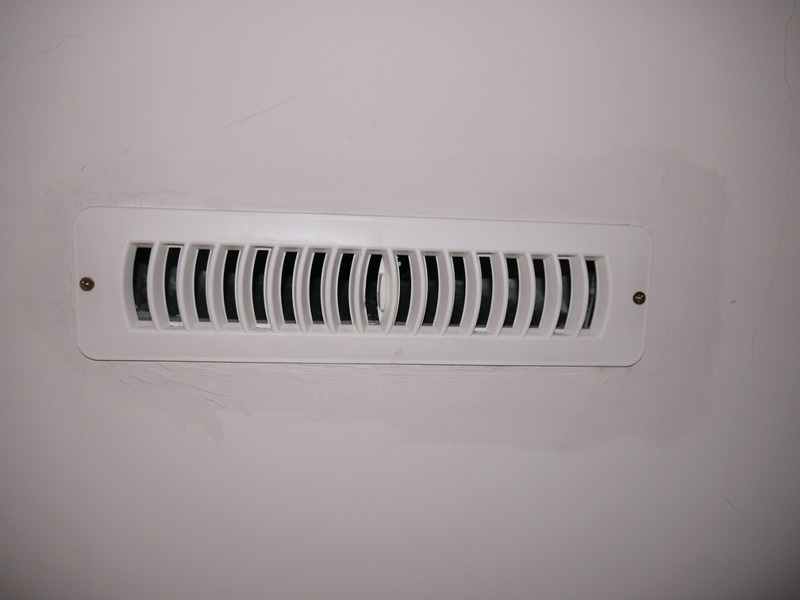 Can air from bath-room vents leak into the attic? Can I use an infrared thermal imaging camera to locate the problem? Infrared cameras are very good to locate surface temperature differences. Snow is a good insulation material and the surface temperature does not change much when the temperature further down changes. Large ice dams form only when some snow deep down melts because the upper layers of snow trap the heat. The top snow layers don't really change their temperature in any significant way. If there is no snow on the roof then the temperature differences will be very small since most heat can radiate immendiately (the insulating snow layer is missing). In other words thermal imaging will only spot a huge problem when used on the outside of the house. Here is the same area where you saw the ice dam in the photo further up shown on a infrared camera. infrared image of the area prone to ice dams, you don't see anything suspicious. 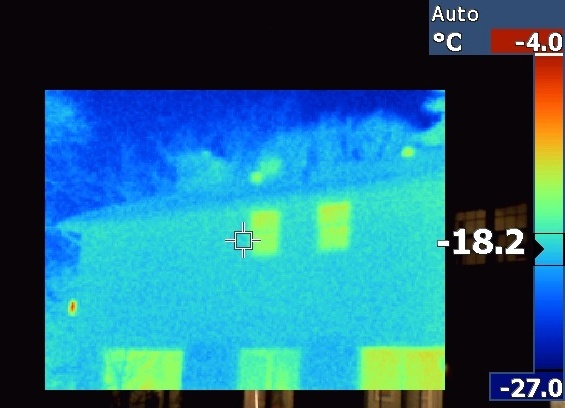 As you can see the infrared thermal imaging is not capable of locating heat loss when used on the outside of the house because the temperature differences are very small. 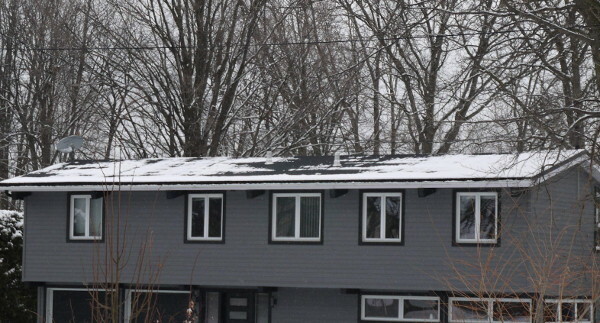 If you want to see those heat patters on your roof then you have to wait for a day in fall or early spring where the roof is just covered with a very thin layer of snow and the outside temperature is just around zero. On those days you will then see a snow pattern that corresponds to the heat pattern and you are looking for areas where the snow melts faster. With the right weather conditions you will even be able to see the rafters below your roof. Very tiny temperature differences become visible. No special equipment needed. 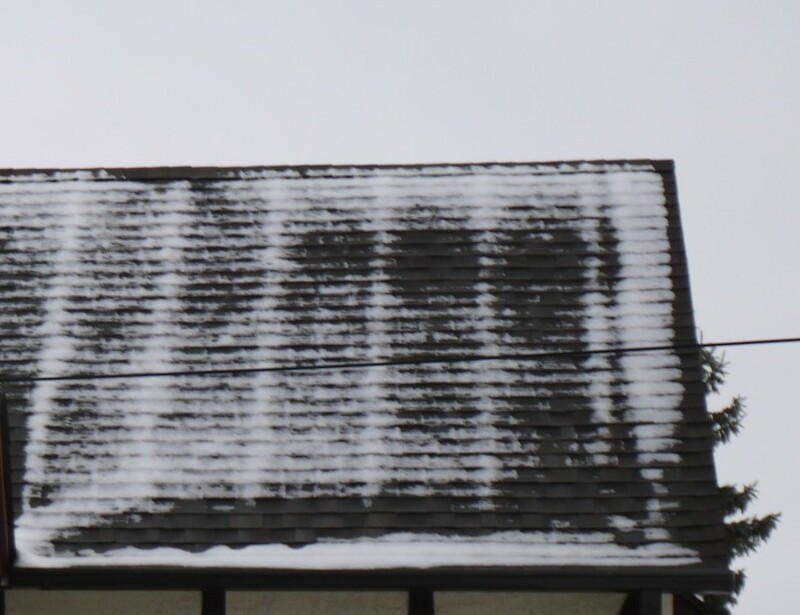 Heat loss pattern visible with a thin layer of snow on the roof on a "warm winter day". 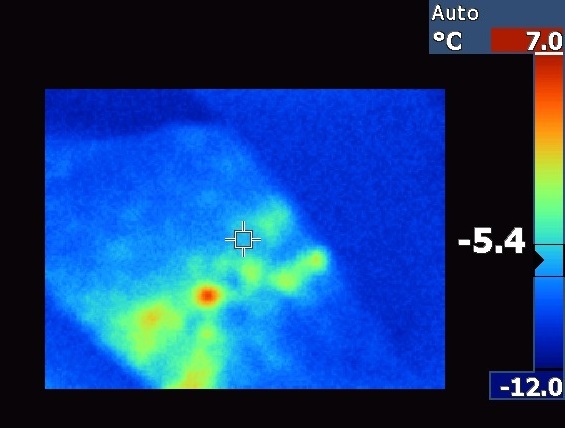 Infrared thermal imaging is not very useful to locate ice dams on the outside of the house but you can locate the problem by using such a camera on a cold winter day on the inside of the attic. It allows you to find the areas where you have heat leaks below the insulation. Here is a nice example. The camera is looking towards the eaves. You see heat leaking through the insulation just below the styro foam baffle. Just in front you see between the rafters a styro foam baffle and there is a heat leak visible on the insulation below the baffle. It is not the best idea to put the heating ducts into the attic since there is always a chance that they leak air but it is commonly done because it is easy to install them in the attic. Glas fiber wool insulation can not seal a stream of hot air. It is complicated to fix this situation but it can be done. I have heating ducts in the attic and that is why I worked on this problem over several seasons and I managed to fix the problem such that I will only get very small ice dams from time to time and in most winters, especially the colder ones, I will have none. You need to find all the leaking joints on your ducts. The most efficient way to find them is to use an infrared camera. Get such a camera on a cold winter day and climb up in your attic. Take notes of all the leaks and mark them. When it is a little bit warmer (not too warm) you go back into your attic. You dig the ducts form under the insulation in the previously marked spots and you fix the leaking joints with aluminum duct tape. Don't use plastic duct tape. It does not last. 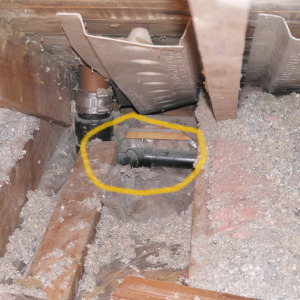 A duct joint leaking air from under the insulation. 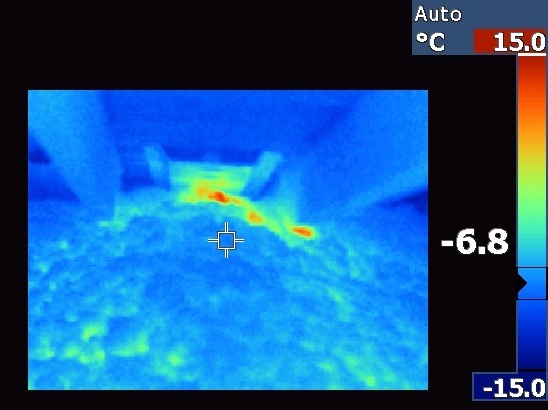 While doing the survey with the infrared camera you will as well see ducts that have too little insulation around them. They are not leaking but they are too high above the attic floor and the insulation around them is too thin. Top-up the insulation around those ducts. I needed two seasons to fix everything. In the first winter I searched for leaks. Towards the end of that winter, when it is more comfortable to work in the attic, I fix those leaks and I toped-up insulation where needed. In the next winter I went back to check again. I fix any remaining problems. You need multiple seasons because the infrared camera shows the leaks only on very cold days. It does not see anything if the background temperature is too hight. It would be like taking a photo of a white paper on a white background. Such a photo would not be very good. You need a different background color. The most common cause of ice dams despite "proper insulation" is a heat leak from the living space. It can be a small hole of some kind. Here is a case where the hot air vent from the heating system is located in the ceiling. It is already suspicious to see no mouting screws on the sides. Somebody did a quick job with a bit of glue. Forced air vent in the ceiling looks suspicious, let's take it off. 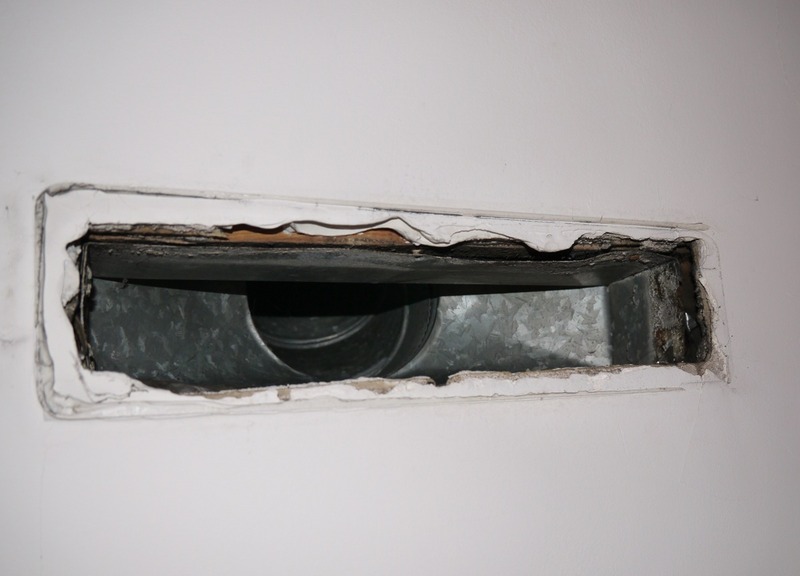 The duct sits loose in a much too big opening. Pressurized air from the duct will not only come down into the room. About 10% will leak up into the attic (yellow arrows). Proper duct installation: close all the gaps. The cover is back on and mounted properly. Icicles and ice dams because of the sun? 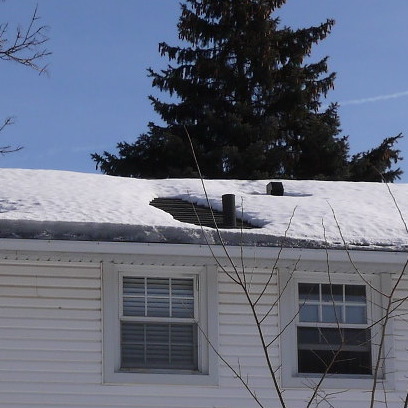 The sun could melt the snow on your roof and cause ice dams even when everything else is working perfectly. The sunny winter days in Canada are usually the coldest. It is the dry air from the north that pushes away the clouds during the winters in Canada and it is therefore very cold during those sunny days. You will not get icicles in very cold weather but on a warm winter day (still below 0'C, let's say -7'C) you could still get icicles with a bit of sunshine even if there is no problem with the roof. Those will show up on the south or south-west side of your roof and they will be small. It is impossible to avoid simply because the sun can provide enough heat to melt snow. However there will not be much of an ice damm and the icicles will only be a few inches long. It is possible to get small icicles because of the sun. This is normal. Here is an example of what can happen when professionals renovate a bath room. For water to flow smoothly without gurgling, there must be an air passageway behind the water. Vent pipes going up to the roof provide that passage. Contractors replaced in this case some of the pipes and attached a new pipe to the drain-waste-vent. To do this they cut a whole in the wall and bath room ceiling to attach to the vent pipe that goes out onto the roof. The ceiling in the bath room was closed but the section that is below the side wall of the bath room was never closed again. "Insulation" material was put back in but warm air can now raise from the house below into the attic through the fluffy insulation material. 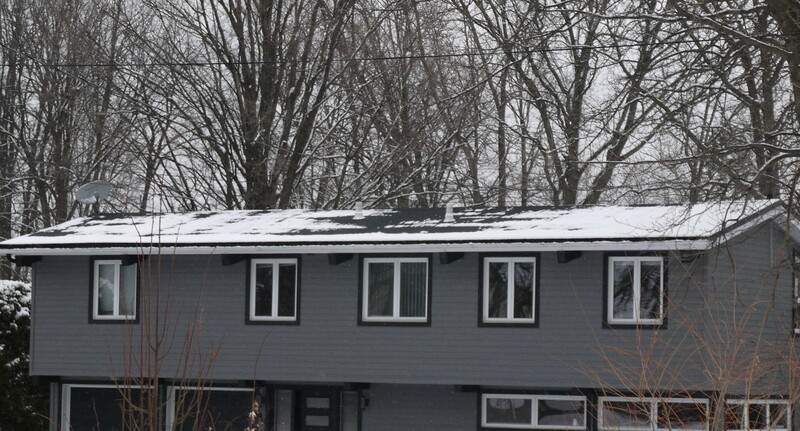 Pict1: snow melts on top of the roof because of a hole in the attic floor that allows warm air to raise through the insulation material into the attic. Pict2: The area marked in yellow is a hole in the attic that leads directly to the inside of the wall in the room below. 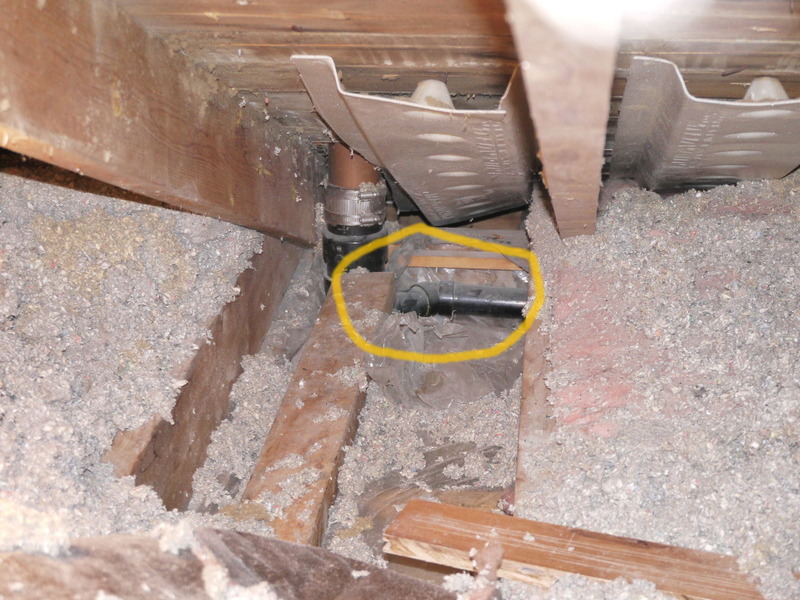 The horizontal pipe you see in the photo is running in the wall below the attic. 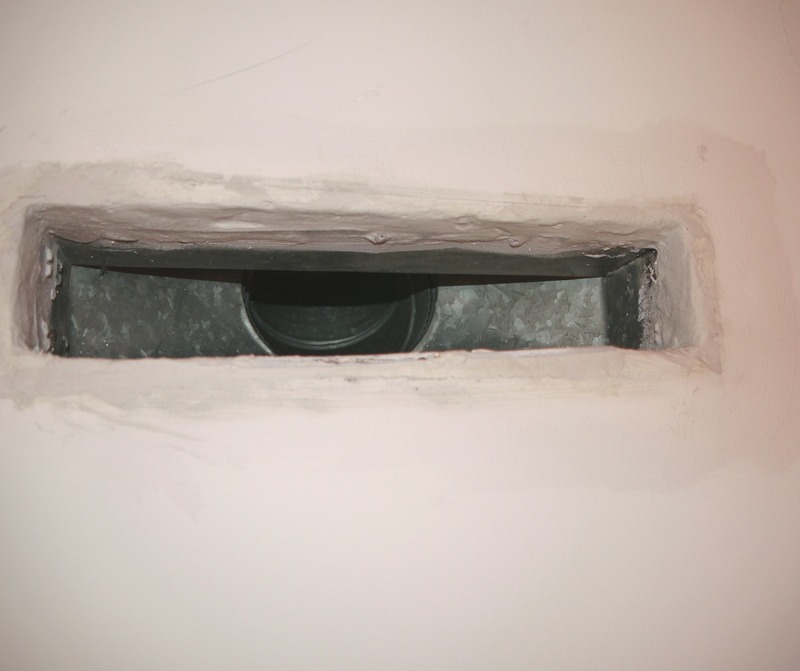 The fix is simple: seal this hole and make sure it is air tight. It's however a lot of detective work that is required to find the cause and it takes a while to dig-up all that fluffy insulation material to find the pipe and the hole. When you plan to renovate an upper bath room then speak to the contractors to see if they understand the importance of sealing any thing that goes up into the attic. Don't just assume that an experienced contractor will know what to do. You might just be talking to a repeat offender. The ice dam itself is not a problem if it is not too heavy for your gutters and if the roof does not leak. The only thing you can see during the winter is the icicles and possibly the ice dam itself unless it is covered in snow. 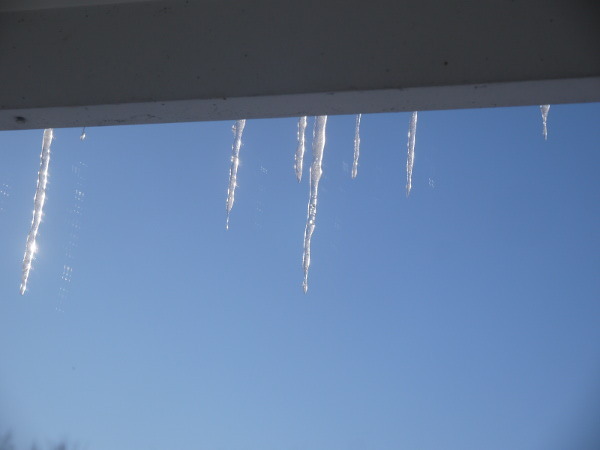 Small icicles are possibly normal and it is not easy to say how long they can be until it becomes a problem because it depends on the type of roof that you have. 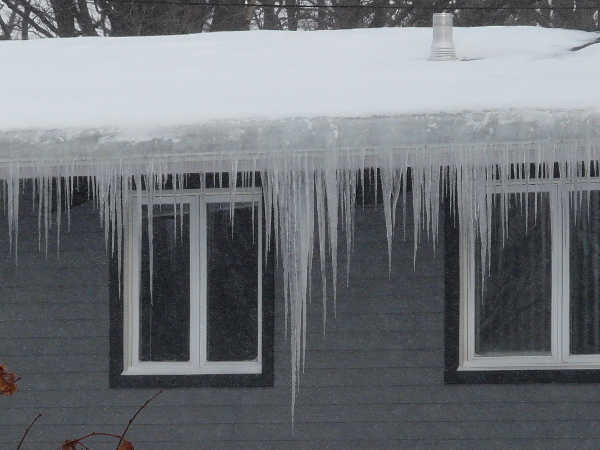 Here are some icicles telling me that this house has an ice dam which is several inches high. 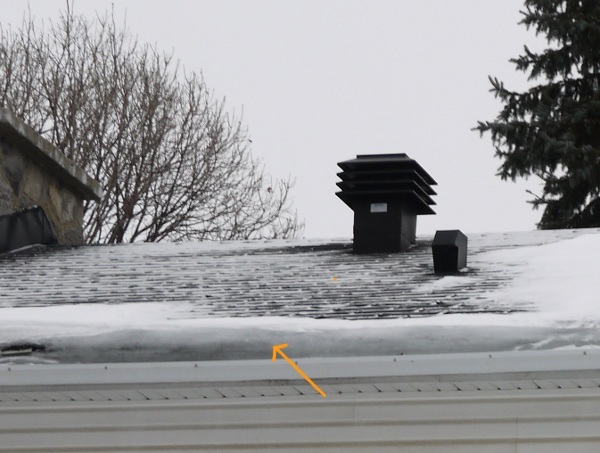 However it depends on the roof: If you have shingles then an ice dam with icicles as shown above will cause water to leak into the house when all of the snow melts. If you have a metal roof with a good underlay then it might not cause any leakage. As stated earlier you can try to find a "warm" day (around 0 'C) in early winter or late spring with about 1 inch of snow and then you might be able to see areas of heat loss. Here is what it looks like for the above house. The pattern you see is very suspicious. In the center you have a large area where the snow melts. It's probably the result of some renovation work where the vapor barrier and insulation were damaged. Often the installation of new ceiling lights or simply running additional cables during renovations is causing such problems. Most of the contractors put what they consider insulation back after working on the ceiling but they do usually forget the polyethylene foil between ceiling and insulation material. This foil, the vapor barrier, is absolutely critical. It stops warm humid air from getting into the attic (it's like a draft stop). The insulation is almost useless without that foil but very few contractors seem to know that. Ceiling lights penetrate deep into the attic and should be covered by an air tight wooden box. Wooden boxes should be wrapped in vapor barrier but there are as well pre-made plastic boxes that are meant to cover ceiling lights inside the attic. 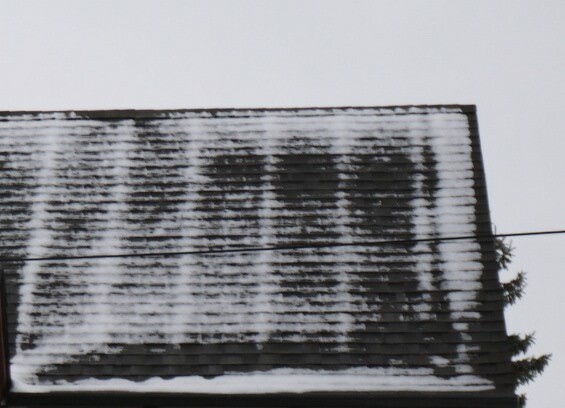 You can see very well that there is no general problem with this roof. The insulation and ventilation to the right seems to be perfect it's just a few spots in the center and to the left. These problems can be fixed by checking the attic in those areas. Often it is just a matter of repairing the vapor barrier with a special permanent tape that sticks well to polyethylene. Such a "heat loss picture" is very helpful because it shows the exact location of the problem. Heat loss pattern for the house with the long icicles. How about putting a membrane under the roof shingles? A strong foil such as "grace ice and water shield" or "resisto waterproofing membrane" is always an extra protection and it is a good idea but the foils come in roles of a fixed width. Water can eventually get behind the foil. Remember as well that all the nails holding the shingles will go through the foil and damage it a bit. Those special foils have some kind of asphalt glue on the underside and it will seal the area around nails but after a number of years the glue will get brittle. It is always good to fix the root cause of the problem. Remove the cause of the ice dam and use "grace ice and water shield/resisto waterproofing membrane" in addition.